Researchers with the US Forest Service and Alaska Fish and Game collared 20 bears in Prince William Sound in the summer of 2016. Milo Burcham photo. Black bear numbers in Prince William Sound aren’t what they used to be. People who hunt, fish, and photograph wildlife in the area are seeing fewer bears, and they want to know why. This summer, biologists collared 20 black bears with GPS devices to better understand the area’s bears. The project is a partnership between the U.S. Forest Service and the Alaska Department of Fish and Game. Milo Burcham, a wildlife biologist for the Chugach National Forest subsistence program in Cordova, outlined the goals. Can a boat-based trapping effort capture a representative sample of bears? Are bears using habitats that make them vulnerable to hunting or do they avoid theses habitats? Are males and female black bears using these habitats differently? Five were too small to collar and they were released, he said. They caught 15 females and 10 males, and collared 13 females and seven males. The bears were caught in foot snares, and researchers then darted the animals with immobilizing drugs. Genetics samples and measurements were taken before the bears were collared and released. “We were surprised by a couple results of our trapping efforts,” he said. “First, that we caught more females than we did males and second, that the average weight of males and females was nearly the same.” The average size was 185 pounds for the females and 193 pounds for the males. 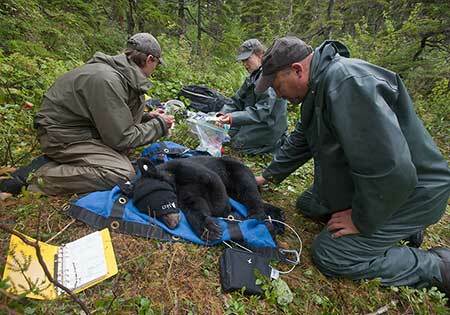 Researchers take measurements and samples as they equip a black bear with a GPS collar. The next step is to look at where the bears go, and how they use their habitat – especially the beaches and shorelines where they are most vulnerable to hunting. Next spring, researchers will look at how many cubs they have and how many survive. The last time Burcham was tracking animals, he was using radio telemetry to follow elk and moose in Montana. That was more than 20 years ago. Burcham said the improvements in technology are incredible. The devices on the collars are smaller and lighter than the old VHF radio transmitters, and collect far more information. Biologists don’t need to fly around hunting for a radio signal to help lead them to the animal – an expensive effort that provides just a single location point. The collars store all of these GPS locations and also transmit location data to a satellite, which generates the emails. And while researchers can access some of the data remotely; other data is stored on the device and will be available when the collars are retrieved. In addition to the location data, the collars record the bears’ activity level at five minute intervals and record the ambient air temperature twice each day. The collars have a three-year lifespan and are programmed to drop off at that time. They also transmit a traditional VHF radio signal, which enables biologist to find the collar. Biologists can track the bear at any time using the VHF radio signal, and will monitor the bear visually as needed. 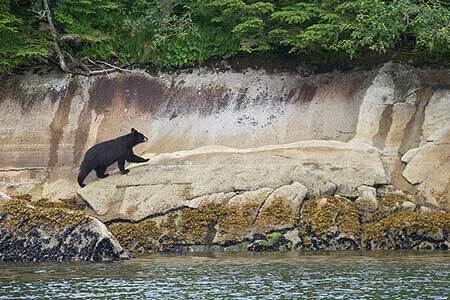 A black bear works the intertidal area on an island in Prince William Sound. Milo Burcham photo. Burcham said he and Westing have collected more location data on bears in the last two months than he was able to collect in years of radio telemetry work in the 1990s. Westing said one key question is whether bears show a preference for a specific area – are there “beach bears” and “alpine bears?” And do male and female bears use the country differently? Human activity in Prince William Sound, including hunting, has increased dramatically in the past two decades. Before June 2000, the Portage Glacier Highway dead-ended at a railroad tunnel about a 45-minute drive from Anchorage. Access to Whittier, in Prince William Sound, was by railroad. The train could accommodate passengers, and about 20 vehicles on a flatbed railroad car. About 20,000 people traveled this way each year. That changed in 2000 when work was completed, modifying the tunnel to accommodate traffic. Overnight, Whittier became an hour-drive for half the population in Alaska. Whittier saw 120,000 visitors that first year, and annual numbers settled at about 100,000 visitors. Many people trailer boats or keep boats in Prince William Sound. 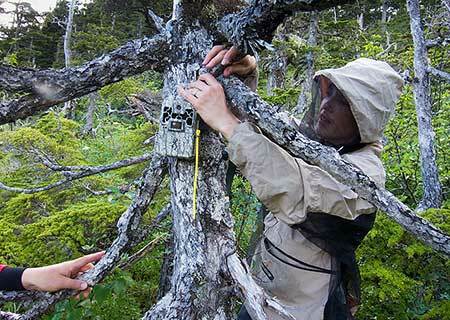 Biologist Charlotte Westing sets up a motion-triggered trail camera in a cloud of mosquitoes. 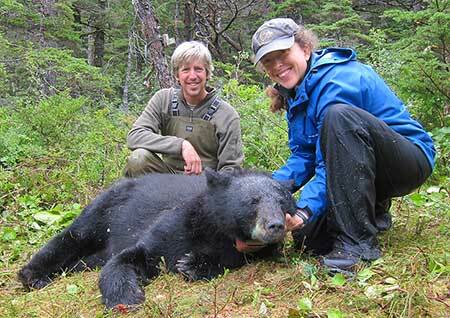 The annual black bear harvest in Unit 6D (most of Prince William Sound) more than tripled between 2000 and 2006. In the 1990s, it was under 200 a year; in the mid-2000s it went up to more than 500 in some years. Additionally, the take of female bears really increased. In the short-term, wildlife managers would like to see no more than 200 black bears a year harvested in the area, and ideally, no more than 50 female bears. “The harvest has been declining since 2007, and around 2013 it really started to tank,” said Westing. In the 2014 regulatory year about 100 black bears were harvested, and in the 2015 regulatory year about 90 bears were taken. The high take of female bears is troubling. Managers want to see fewer than 25 percent of the harvest as females, and it’s been close to 40 percent for many of the past 15 years. Steps have been taken to curtail hunting, but it’s not just hunters that are seeing fewer bears. Burcham said there are a variety of factors other than hunting pressure that could explain why people may be seeing fewer bears, or why there may be fewer black bears in Prince William Sound. The “snowpocalypse” could be one factor. The winter of 2011-2012 brought massive amounts of snow to the region, and Burcham said in some areas snow persisted at sea level into August. Such a weather event could affect bear survival, especially cub survival and recruitment. Biologists Charlotte Westing and Milo Burcham with a Prince William Sound bear. Researchers weighed all 25 captured black bears. The average size was 185 pounds for the females and 193 pounds for the males. Milo Burcham photo. That was followed by three consecutive mild winters, leaving elevations below 1500 feet with little or no snowpack. Mild winters could affect bears in several ways. It is possible that without the insulation value of a snowpack, bear overwinter fitness could be reduced. “We know people access bears at choke points, high-use areas where it’s possible to access bears,” Westing said. Researchers are hoping to learn if bears from hard-to-reach areas that don’t see a lot of human activity disperse to those high-use areas. The partnership between the state and federal agencies will continue for several more years. Researchers collected genetic material as part of a larger genetics based ADFG project led by Sean Farley that will focus on a broader scale, aimed at increasing understanding of coastal black bears. 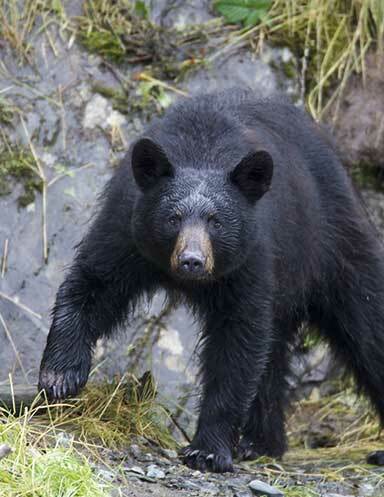 Researchers plan to collar at least twenty more black bears next year. The next set of animals will be collared in a different area, one that gets less hunting pressure. “Over the course of the next three or more years, we hope to collar a total of over 50 animals,” Burcham said.